Located northeast of Libourne, Pomerol is one of the most prestigious regional wines from Bordeaux. It is a small region known for its high quality wines made predominantly from the Merlot grape. 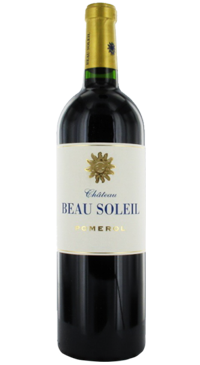 Château Beau Soleil crafts their wines from a small 3.5 hectare plot of Merlot. This 100% Merlot is exhibits a finesse and roundness in the mouth with notes of fresh red fruits, licorice, and flowers. Offers an ample toasted layer, with ganache and graphite notes holding sway for now, showing more than enough blackberry and black currant fruit at the core. Dark licorice and fruitcake flavors pump through the finish. Best from 2015 through 2022. 1,915 cases made.